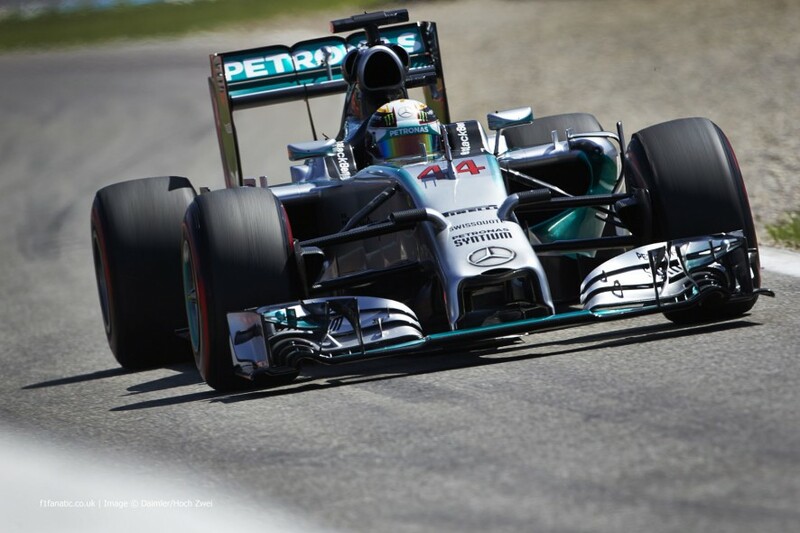 Formula One: Mercedes on top in German practice! 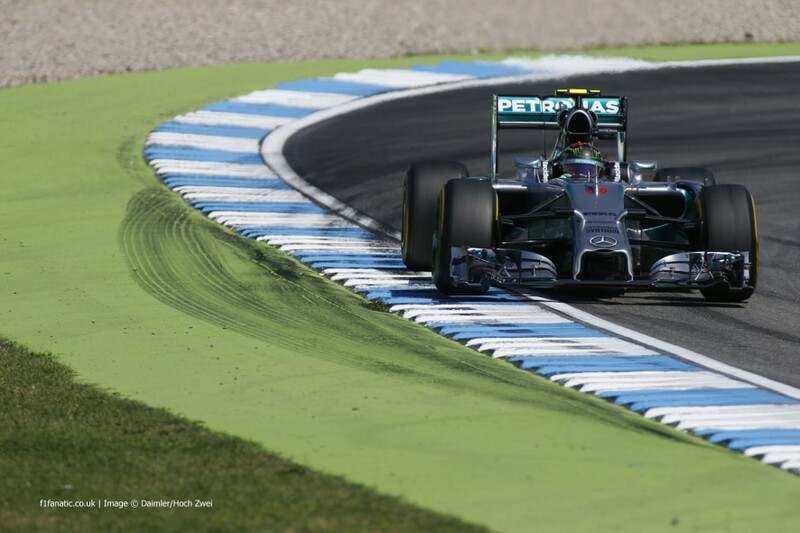 Home » Formula One: Mercedes on top in German practice! Mercedes were once again on top today as the German Grand Prix weekend got underway in Hockenheim, with Rosberg and Hamilton fastest in both Friday practice sessions. Nico Rosberg was fastest in the first session as he hoped to cap off a brilliant week with a win in his home country. He watched his country become victorious in the World Cup, the reason for his new helmet design, and then got married during the week. He was just a few thousandths ahead of team-mate Lewis Hamilton, who had been held up on a possibly quicker lap by Nico. Fernando Alonso was third fastest, a much seen trend of first practice sessions throughout this year. The FRIC suspension system implemented by most teams this year had been banned in the run up to this race; with many believing that the pace of some teams may change. Ferrari seem to be one of those who have not been hurt by the ban. Daniel Ricciardo was 4th fastest for Red Bull, with Jenson Button 5th in his McLaren. Their team-mates Sebastian Vettel and Kevin Magnussen were just behind, with Kimi Raikkonen 8th despite being delayed by a water pump problem. After a disappointing Grand Prix weekend debut in Silverstone FP1, Susie Wolff was back in the cockpit of Valtteri Bottas’ Williams. Initially it looked as though she was to suffer more mechanical failures like she had done so in Britain, but she managed to bring the car back to the pits and then re-emerge to set the early pace. She managed to record a best lap that was just 2 tenths slower than team-mate Felipe Massa. The heat escalated in the second practice session of the weekend, but not necessarily on the track. Temperatures had reached a high of 44C during FP1, but the scorching heat took the track temps to a blistering 58C in the second 90 minutes. Lewis Hamilton took the top spot away from home hero Nico Rosberg in a session where heat became an issue in the reliability of the cars. The gap between the pair was just a few thousandths, with both drivers being warned to cool their cars throughout the session. Rosberg’s brakes were suffering in particular, with significant smoke spotted as he pulled into the pits at the end. Daniel Ricciardo, Kimi Raikkonen and Kevin Magnussen completed the top 5, with Williams making gains as Massa took 6th. Button and Vettel were 7th and 8th, with Alonso and Bottas taking the final 2 top 10 positions. The FRIC ban seems to have closed the field up slightly, with only a second covering 1st and 10th place. Both Caterham cars suffered mechanic set-backs during the session, with Kobayashi suffering a small fire at the rear of his car.